Home Faith Don’t Freak Out. I Read Tarot Cards. 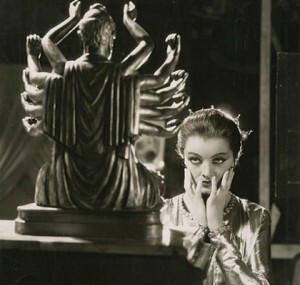 Scary psychic Myrna Loy as Ursula in “Thirteen Women”. I think one of the reasons I really enjoyed living in Hawai’i (beside the obvious like beaches and overall “coolness” of the place) was the sheer acceptance I felt from everybody I met -except maybe from my wealthy employer. As a deeply spiritual person, I just felt “right” in Hawai’i. Now I’m back in Arizona (which is only slightly better than living in Charleston, South Carolina when it comes to all things esoteric). I get two responses when I break out my tarot cards in a public place: excitement and fear. The fear is immediately made obvious because a person will veer as far away from me as possible. As if coming within close proximity of me and/or my cards will burn them in an eternity of damnation. My favorite form of fear is the über-skeptic. That’s when people look down their noses at me questioning how a person could be breathing, yet so obliviously-ignorant, as to believe in something as foolish as tarot cards. The original “Ex Libris Tarot” book that I made just for me during my tarot learning and spiritual progression. On the other hand, there’s the excitement some people feel when they catch me shuffling a deck of pictured cards. “Oh my gosh! You know tarot cards?!?!?! Oh, read mine! Do me! Do me!” Those make me happy. Not because of any unquestioning belief in the tarot but for their simple openness to it, even if they are “really nervous and scared because I’ve never done this before”. 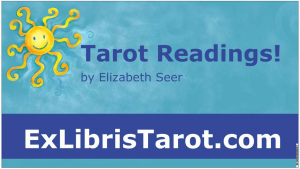 Unlike our clareaudient, clarevoyant, clare-blah-blah-blah friends, who can keep their “insight” a secret, tarot readers are immediately recognized when we break out those cards. I’ve been called a devil worshiper, a witch and other well-thought-out names debasing my humanity. (Note to all my witch friends – being called a witch isn’t hurtful. Being called a witch by somebody who genuinely believes witches are evil is what makes it an ugly term). Those names and deeds couldn’t be further from the truth. I am a reasonable person with a different understanding of the Universe that we all share. First-timers who nervously sit down with me will often end up crying with joy or sighing with a smile of relief after receiving a tarot reading. My understanding is that the readings I offer are validating. I don’t tell anybody anything they don’t already know on some level. I simply bring out the facts and spotlight or present them with a different perspective of their situation(s). I hear over and over again how my interpretation of the cards makes people feel better or even lighter; as if “somebody else gets it”. There’s nothing dark or ominous or even biblically-illegal in that. Making people feel spiritually uplifted is a job we should all be sharing. Why do you charge for readings if you’re so spiritual? I love that question. The answer is quite simple. Churches need money to cover their overhead (including the care and feeding of the priests who give their time to the Church). People simply don’t work for free. An outlay of time and energy should be rewarded in kind. My conscience is also clear because I simply don’t charge ungodly amounts of money for my readings. My outlay of time and energy is worth every penny I ask for… and that’s when I actually charge! 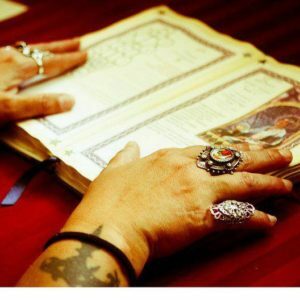 I give many, many, MANY more readings away than I charge for – especially through charity events, etc. Just sit back and enjoy the experience. I promise it won’t hurt. The banner declaring my readings. psychics, public tarot, tarot fear, tarot readers, tarot readers are people too, tarot reading, tarot stigma. Bookmark. Love it! You are right about the closemindedness of zonies!